i had a pair of waterproof trousers once. well, to be perfectly honest, i still have a pair of nylon wotsits, but i'm referring to a hardy pair of goretex breathable efforts for those days in the hinterlands. to be fair, they were intended primarily for walking rather than cycling, but since i did my fair share of the former in my search for suitable subject matter that my paper and charcoal might describe in an artistic manner, i didn't see much of a problem at the time. unfortunately, the trousers didn't share my optimism; they were bulkier than cycling demanded, flappier than could be justified by aerodynamics, and not quite as flexible as i'd hoped. to top it all off, and many will identify with my thoughts on the subject, they weren't anything like as breathable as i'd thought goretex was supposed to be. based on this evidence, i'd say cyclists perspire at a substantially greater rate than those concerned with simple perambulation. 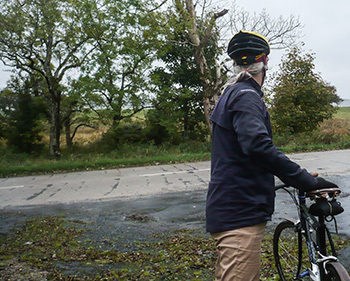 on one of my long-forgotten rides to scotland via the island of arran, i met a cycling companion who advised that he rode year round wearing shorts in favour of any form of lengthier legwear. "there's nothing more waterproof than skin" was, i believe, his reason for so doing, and he may just be right. even wet legs are far preferable to squelchy fabric when sat in the coffee shop or in the queue to buy a ticket for the ferry. except, life's not always like that, is it? though even he'd likely agree that there are times in his life when he's looked a tad healthier and less wizened, phil collins has been something of a major influence on many a drummist and at one time, the epitome of relaxed cool. it's from where the idea came at one time in my life to wear sand coloured chinos, or at least a verisimilitude thereof. while all and sundry were still clothed in jeans, a pair of baggier and more visible trews were not only easier on the legs when hi-hats and bass pedals were concerned, but proffered the notion to an ignoring public that one was almost unconcerned with the travails of daily life. that period of attempted sartorial exclusivity took a mammoth nosedive when i started wrenching, as my friends in portland would say. bicycle oils and less than pristine rims and tyres were not comfortable bedfellows with lightly coloured and ever so slightly baggy trousers. so it was back to skinny jeans and an endless round of black trousers that has pretty much continued until today. and then along came epic. 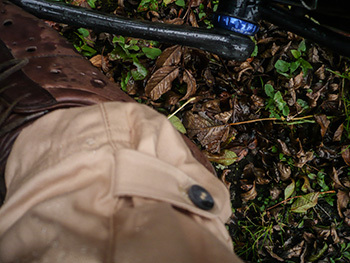 if you can cast your minds back to april of last year, i reviewed a rainjacket sent from nick hussey's then fledgling vulpine clothing business, a garment fashioned from the selfsame epic cotton. rather cleverly, this is constructed from strands of cotton thread coated in silicon prior to being woven into the end fabric. most breathable, waterproof fabrics receive their resistant coating after lengths have been created, one of the reasons why they subsequently lose at least a portion of their waterproofing over the years as the fabric is subjected to wear and tear. that's not something that epic is prone to. 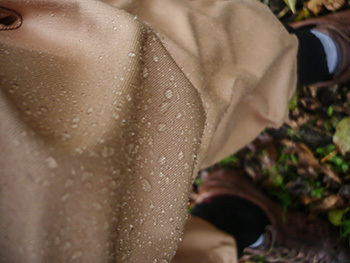 the vulpine rainjacket looked and felt just like ordinary cotton rather than a crinkly man-made textile, a feature that commends the vulpine epic trousers to the sort of relaxed wear that phil collins would revel in. i'm sure he'd even play drums thus dressed. for though these are available in charcoal, indigo and green, i went all genesis and asked for the sahara. and i'm so very glad that i did, because i think they're the best thing since supper's ready. unlike many pairs of cycling trousers in which i have ridden, these do not emulate a pair of drainpipes. i do understand why that's a frequent forte of cycle trousers designers; less to flap about and a reduced chance of catching in anything velocipedinal. but it's not always a great look in a business meeting or a night at the opera. and believe me, there are easier garments in which to percuss on a drum workshop double pedal. but daily strains and stresses; what if i get caught in rain on the way to glastonbury's main stage? this is the point where epic cotton starts to justify its price premium, for all those silicon threads have an intense dislike of precipitation. but first the details: the waist is closed by means of a hook on the waistband, aided and abetted by a front button. inside the waistband is some grippy rubber stuff to keep all in perfect place while pedalling is being undertaken. there are belt loops, but should the waistband be just a smidgeon too wide, there are a couple of buttonable adjustable tabs, one each side. to avoid discomfort in the saddle, there's an appropriately shaped gusset intent on lesseing those unspeakable moments with misplaced seams. inside one of the two front pockets is a hidden zipped pocket for your phil collins cd, while the rear pocket carries on vulpine's tradition of magnetic closures. at the hem of the right leg is a small buttoned tab adjacent to a second button to perform the task that was once the province of the humble bicycle clip. 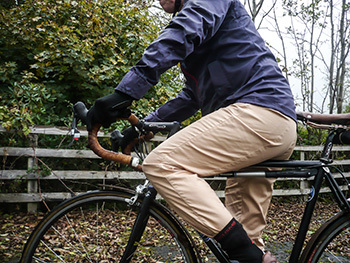 vulpine's website pictures the right trouser leg turned up above the sockline and displaying an inner reflective seam to speak volumes at following headlights. 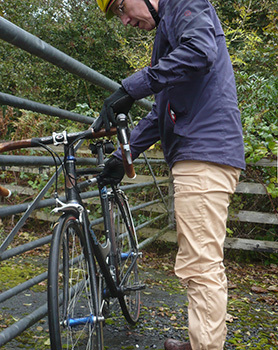 old traditionalist that i am, my cycling activities clad in such style eschewed both the vulpine suggestions in favour of tucking the trouser legs into my socks. not a great look, i'll agree, but ever so practical. and so to the weatherproofing. the monsoon season my have been heralded at the time of my second or third outing, but the last offered the very conditions that would test every mettle i could find. stopping in the rain only twice to allow for roads being mended, my 30km ride interspersed with a froth stop, experienced just less than gale force winds and persistent windblown rain. i'm sure the bulk of most commutes take place in between many an office building and/or shops, but this particular coffee infused escapade inhabits wide open spaces with no shelter for miles. to put not too fine a point on it, i got soaked. however, this is not the ignominy it might at first seem. there's a certain satisfaction to be gained from looking down and seeing thousands of little baubles of water clinging to the exterior of the trousers. however, just above the knees, where the bulk of cycling-related activity is taking place, those droplets have coalesced and taken liberties with the waterproofing; my knees became a tad damp. but there is, of course, more. breathability is an ever-moving target, and previous rides had highlighted a predisposition for modest internal dampness at the very same location. 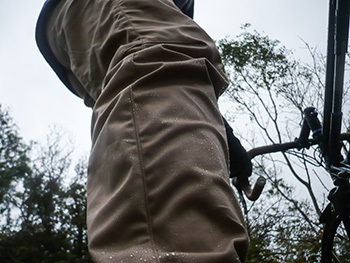 therefore, though just above my knees was lightly damp on my return (after 30km in the rain, mind), i'm inclined to consider the effectiveness of the vulpine cotton rain trousers as being surprisingly more successful than i'd thought i would give them credit for. i know what i like (in my wardrobe). vulpine cotton raintrousers sell for £140 and are available in sizes small to xl in sahara, charcoal, indigo and military green.